We are engaged in trading, distributing and supplying a wide range of AC Variable Frequency Drives. 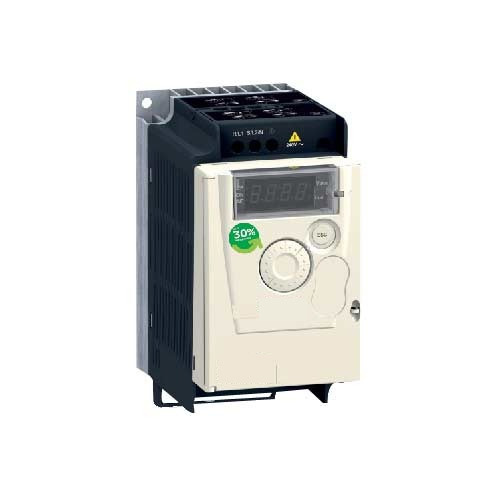 This AC variable frequency drive is s a type of motor controller that drives an electric motor by varying the frequency and voltage supplied to the electric motor. In adherence to the set industry standards, our provided AC variable frequency drive is precisely manufactured using high grade components and latest technology. Moreover, to ensure the hassle free operations, the offered AC variable frequency drive is stringently tested by our vendor's experienced quality experts against several quality parameters. We are the channel partner as an automation specialist for schneider electric. Incepted in the year 2007, we “Aptus Automation Pvt. Ltd.”, have gained success in the market by Manufacturing, Trading, Distributing, Exporting and Supplying quality assured range of Temperature Controllers And Indicators, Photoelectric Sensors, Relay Modules, AC And DC Drives, Human Machine Interface, Auto Tune PID Controllers, Thermocouple RTD Sensors, etc. Under the leadership of our Director, “Mr. Hiral Shah”, we have gained huge client base across the nation. We have constructed a huge and ultramodern infrastructural unit that is situated at Ahmedabad (Gujarat, India), and help us in the production of the best class electrical products in numerous specifications. We have systematically divided this infrastructural unit into various departments such as admin, quality testing, R & D, procurement, production, etc. All these departments are managed by our highly skilled professionals, who hold rich industry experience. Apart from this, we have become the prime choice of our clients due to our ethical business policies, quality centric approach, customized option, positive records and punctual delivery. We are exporting our products all over the world. We are manufacturing our products under our own brand name Aptus and we are authorised trader and distributor of brands like JCT and Schneider Electric.